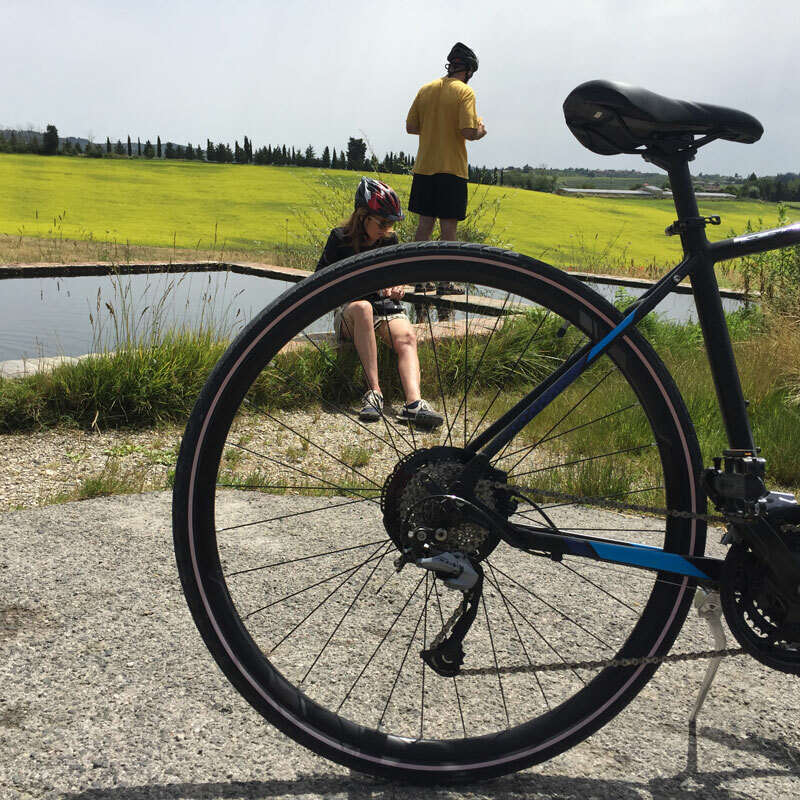 If during your journey through Tuscany you’d like to combine a bit of workout with a delicious Chianti wine-tasting, then you will surely love to ride there on a single-day cyling from Florence to Siena. By joining a single day touring from Florence to Siena by bike you will enjoy a fun adventure, with Siena as your final treat. After a 8 kilometers up-hill section we reach Castellina in Chianti, with its stronghold and ancient Castle, the Church, the small Village you can walk through. After this brief stop, we head down the exciting slope following all the way to the valley floor, making up for most of our cycling journey, and immerging ourselves more and more in the nature, under bright green trees, a clear blue sky and shining, warm sunlight in order to enjoy the first real day of spring this year. After about 20 minutes rolling it’s time for the first mandatory checkpoint of our tour: the Mazzei winery in Fonterutoli. We stop by and try out their selection of local wines made both following the classic tradition that uses the typical San Giovese grape, or mixing San Giovese with other fine French and Sicilian grapes. Having taking our breath and various sips of wine too, our bike trip form Florence to Siena continues. We hit the road again, breeze in our face, down until our second checkpoint: the Fattoria di Lornano cantine. 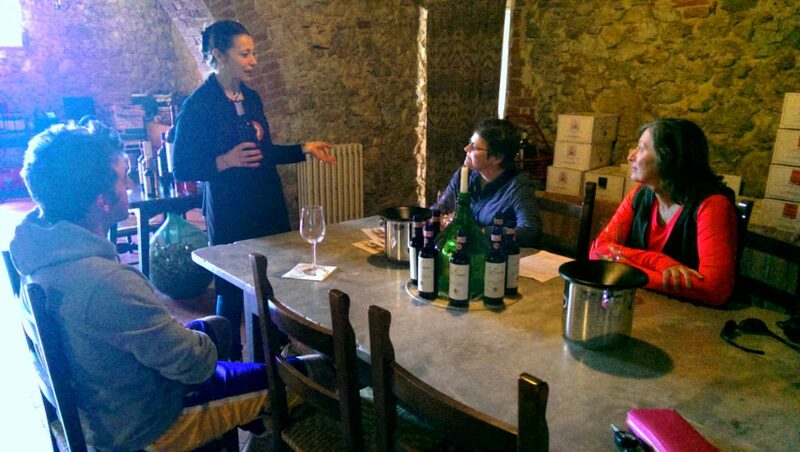 Here we enjoy the guide of Angioletta, a member of the winery, herself explaining the history of such a traditional family business which digs back centuries. 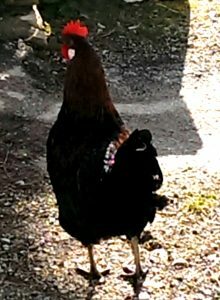 Angioletta gives us an insight on the traits that are required to obtain Chianti denomination and its world famous rooster trademark, recalling the image of a Chianti-typical black rooster, such as the living one we previously encountered on the streets of San Donato! Now, after developing some more background knowledge and testing hands-on the difference between these wines and other local or imported wines, it’s time to get back to cycling. Taking one last grasp at the astonishing view of the Chianti valley at the brightest time of day, roll down the last miles of slope, before we strap our bikes to the van in order to skip the steep up-hill and head straight towards our last stop: the beautiful city of Siena. Finally we find here some time to rest, eat, restore ourselves, visit the city centre and then reunite and hop back on the van. Driving on the way back to Florence, we’ve got more time to enjoy the various other beauties of the Chianti area, recall today’s journey, or even – quite legitimately – take a nap. 4 Comments On Florence to Siena by bike! would your tour operate on that date, and would it be possible to transport a suitcase from Florence to Siena? If so, could you give me some idea of price? Hi Nick, thank you for contacting our blog. We will be glad to have you touring with us from Florence to Siena in July. Hi Nick, thank you for contacting us! I will immediately e-mail you with all the details you need.